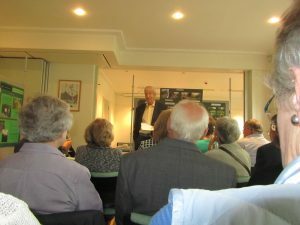 A Trust evening was held on 10 July at West House in Pinner at which there were a series presentations and a meeting of the HHT Committee at which the various issues affecting the Trust were given a public airing. The evening opened with a presentation by Martin Verden (Chairman of both the HHT and the West house and Heath Robinson Museum Trust) with the plans for the construction of the new museum to house the works of Heath Robinson and was followed by a short talk by Joanne Verden on the adjacent Peace Garden, which those present were invited to visit. Geoffrey Beare then spoke about Heath Robinson and how his career evolved. The evening concluded with a meeting of the HHT Commitee during which there was discussion about the stance to be adopted in response to the proposals for Pinner Park Farm. See below.